I was joking with my children last night as we were reading a little book about the 12 days of Christmas and the symbolism used by our Protestant forefathers to communicate the biblical message of the season in code for fear of persecution. 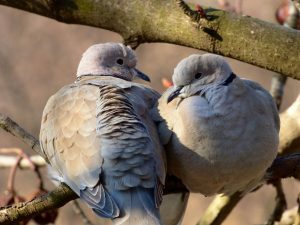 We read, rather we sang, “Four calling birds, three french hens, two turtle doves, and a partridge in a pear tree.” As I often do, I turned the song into a theological case for the importance of birds and bird watching. I do this often as my family knows that I am hopelessly obsessed with the feathered kind that the good Lord was so kind to bestow upon us. I do this in the appearance of jest, to get a smile from everyone and to justify my lifetime hobby and pastime, but if I really were to get down to it, I do this because I believe it to be true. Now, if this sounds very well thought out and polished, you obviously don’t know me. Words in print beautifully conceal my lack of oratorical skills, which my sweet and patient family can also attest to. But back to the birds. I remember a time in my undergraduate years as a residence hall assistant. I lived in the college dorms for five years, spending three babysitting freshmen to help pay for out-of-state tuition. The director of the dormitory, Jeff, knew of my growing bird interest and so he printed me a list of all the bird references in the bible. Seldom have I received a gift as touching as this one. He knew my heart. It was almost too much to be quite honest. Years later as a graduate student in Raleigh, NC I remember spending nearly every morning on the hardwood floor looking to the east as the sun rose. My morning meditation had developed into an organic sort of thankfulness. It became my custom to start my day with the words, “Thank you Lord for your wonderful Word, thank you for your beautiful birds.” I was studying several forest-dwelling songbirds at the time. Years later I remain captivated by these creatures. The intricacy of feather patterns and feather types aligned to create a mechanical and visual masterpiece. Let us be intentionally thankful to the Lord for his Creation this year. It is good because He is good and because He said it is very good. Let us show the world what Christ is like through our love for one another in the Church as His bride and also through our care for his remarkably complex Creation. This Creation sustains us physically, mentally, and spiritually for it is densely packed, as is His word, with revealed truth. His providence is altogether lovely. Let us consider how to stir up one another to love and good works. (Hebrews 10:24). Let’s do this in 2018!